Turn the page. Item two in my volume is a 1794 show tune. And there’s another from the same musical, The Cherokee, a few pages further on. 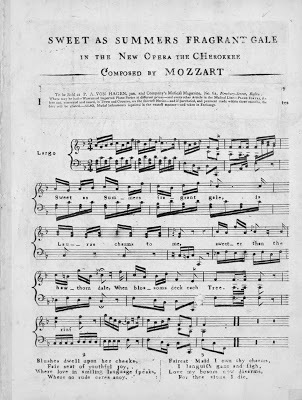 After mixed reviews, the piece played sixteen nights at Drury Lane, had a flop revival, in a revised version by its leading tenor, in 1802, and would doubtless have disappeared, but for a couple of cute ballads and … its title. In the 20th century, when it became fashionable to be ‘indigenous’, on one side of the world or the other, a work entitled The Cherokee was ripe for rediscovery, re-publication (Belwin Mills, 1977) and even performance. 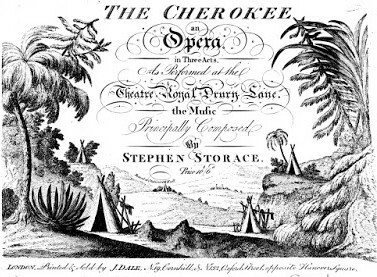 ‘One of the first representations of Native Americans in music was in Stephen Storace’s opera The Cherokee (1794)’ tells us academia. Nonsense. And I imagine that what were then called Red Indians wouldn’t have been very happy with their ‘representation’. The Indians of The Cherokee might not be as hilarious as the dancing murderess of Rose-Marie and her ‘Totem Tom-Tom’, or those of a hundred Hollywooden ‘cowboys and itchybums’ films, but they are quite simply Ruritanians. Nothing else. Standard baddies (except for one) with, this time, painted faces. And splenditious and exotic scenery and costumes representing an 18th century Englishman’s idea of the Ruritania that was outback America. 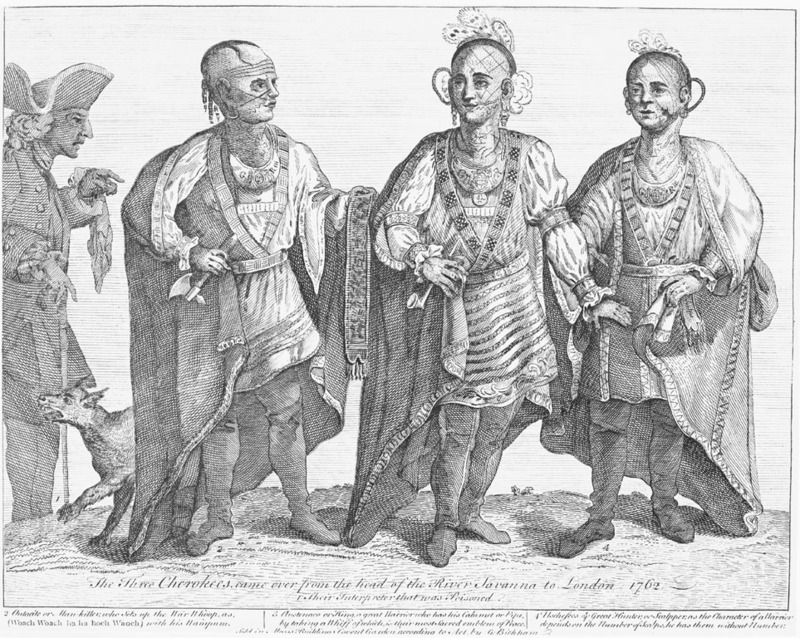 The Red Indian had been portrayed on the British stage for decades previously, in 1762, when three ‘Chiefs’ visited London to look at the King, the Tower of London and the might of the British army, and got drunk in the public gardens. 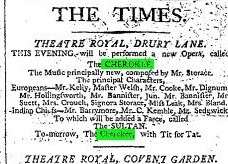 The Drury Lane pantomime that year was titled The Witches, or Harlequin Cherokee, a book of ‘convivial’ (men only) songs included one on ‘Cherokee Chiefs’ … just like the Maoris a century later, or the Shah of Persia in his turn, the Cherokees were the exotic curiosity of the day. 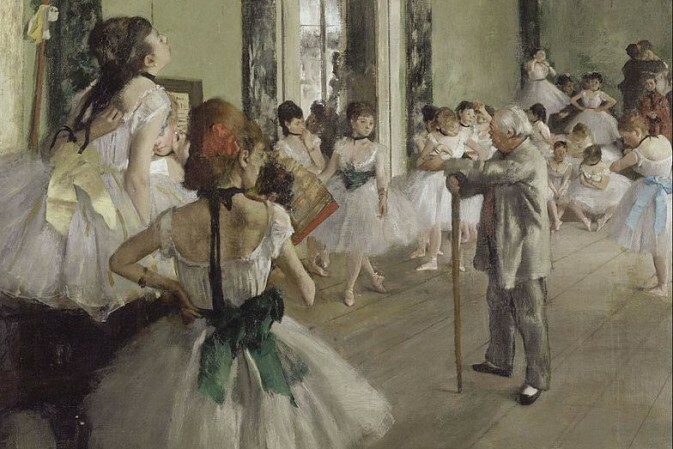 Their turn in the limelight came once again in the 1790s on the occasion of another visit. A racehorse was named Cherokee, Cherokee sauce was bottled, a breed of strawberries was christened Cherokee, and James Cobb, who had recently had such a huge success with The Haunted Tower, penned a libretto for Stephen Storace and Drury Lane and its company in which the nasty lubricious villain who kidnaps the heroine was a Red Indian chieftain (Mr Barrymore) instead of a haremic Sultan or a wax-moustachioed gent in spats. The Cherokee was a large piece. It had its dramatic plot – the capture and ultimate rescue and return to her husband (Michael Kelly) of the heroine (Mrs Crouch) and her son (Master Welsh) after some Perils of Pauline adventures, ending in the murder of the unassuaged villain – it had a standard ‘soubrett’ plot about two cousins (English) determined to dislike each other who finally decide that of course they don’t, and it had roles and numbers for the other principal members of the company, which were more or less attached to the plot. The Times found ‘Action and character, with the serio-comic, happily and forcibly blended create a string interest and excite attention and mirth seldom to be found united’. And just needed some curtailment to the dialogue. Others found it all far too complex. 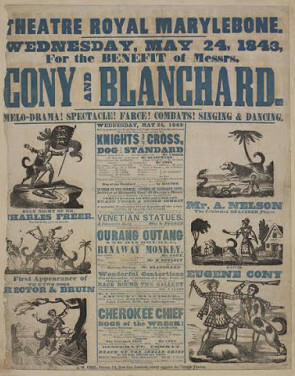 The Cherokee also had a large score, of more than thirty songs and ensembles, ‘principally composed by Storace’ which was published in what was said to be its entirety. Pieces by Mozart, Bianchi, Ditters von Dittersdorf, Sarti and Anfossi were said to have been used, but the Mozart (‘Sweet as summer’s fragrant gale’) sounds like ersatz Mozart and only the Ditters song (‘The fields there wonted hues resume’) is identifiable. About the music there was no quarrel. It was well liked throughout. 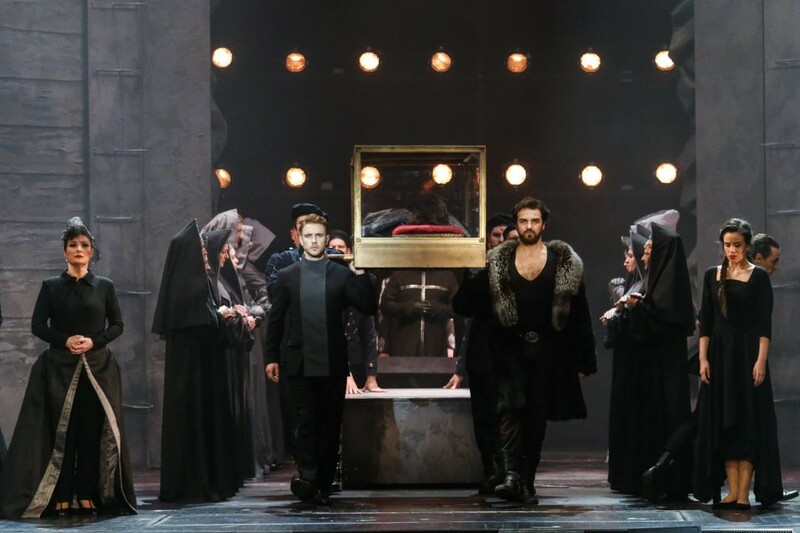 The Times picked out the revenge solo and chorus ‘Oh Power unknown’ (known as the War Whoop chorus), sung by Sedgewick as the ‘good’ Indian of the story and the ensemble, and the second act finale as the gems of the score. Jack Bannister, who played the boy cousin, Jack Average, later wrote in his memoirs ‘The Cherokee chorus was one of the grandest ever composed; the effect was sublime…’. The ‘fine choruses and finales’ were indeed the backbone of the score, but it was the solo songs and the duets which were going to make their way on to the nation’s pianofortes and into family volumes like mine. 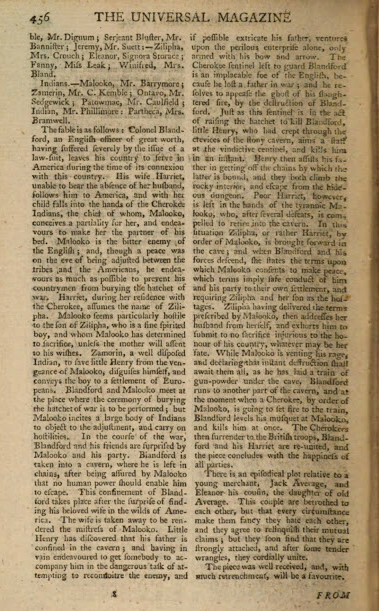 The Times picked Jack’s song ‘Glory Firing’, the ‘Constitutional sea song’ ‘Our country is our ship’ given by Dignum in the role of Ramble and ‘a beautiful little Welch air’ sung by Maria Teresa Bland as a beautiful little Welsh Winifred who somehow wandered into the proceedings if not the plot. The music of the piece was apparently a familiar Welsh air arranged by Storace, and variously known as ‘Fal Lal La’, ‘The Shepherd and the Bird’, ‘A little bird sat on a spray’, ‘The Little Bird’ or, as in my copy, ‘A Shepherd Once Had Lost His Love’. 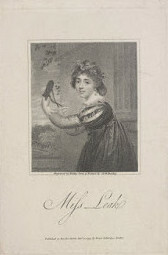 If Winifred seemed to be in the piece mainly to sing her incidental songs, even more was the case of Fanny, a minor role played by Elizabeth Leak. Fanny got to sing the conventional ditty ‘A Sailor lov’d a lass’ and it, too, proved to be drawing-room material. What a din, what a glorious rattle! 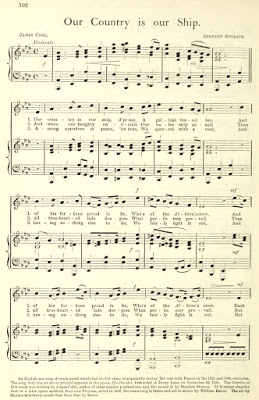 When the piece was revived by Kelly for Mrs Billington, The Times grumbled that ‘The music is very fine, particularly the choruses; but we have again to lament that more endeavour has not been made to please the ear by simple melody … Mrs Bland ran away with almost all of the applause by singing the old ballad of ‘A Shepherd once had lost his love’. The ‘old ballad’? Well, it certainly predates The Cherokee, for I see the lyric in a song book of 1790. Roger Fiske in Scotland in Music, while giving the melody as the source of Beethoven’s Op105 I (Scottish air), denies its Welsh (or Scottish) origins. I don’t know why, but he may be right. Ersatz Mozart? Fake Welsh? The song remained popular for a number of years. 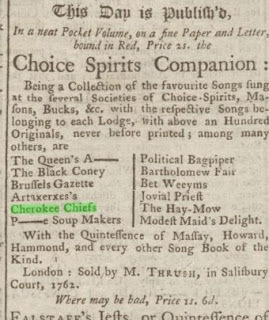 It would be nice to know if the eighteenth century commentator who wrote of one arrangement ‘An arrangement for the domestic musician of a traditional Welsh air made popular recently by Storace’s use in his comic opera The Cherokee’ was right or not. The Storaces were close friends of Mozart in Vienna. Nancy , a star performer, was the first Susanna in the Marriage of Figaro, Michael Kelly playing Don Curzio. There Stephen wrote Gli Equivoci, based on The Comedy of Errors, with a Da Ponte libretto.Back in London the Storaces worked at Drury Lane but Stephen’s Viennese style had to give way to popular ballad operas with short songs instead of through composed ensembles etc. Such was The Cherokee.